The newly opened Gallery House combines some of our favourite pastimes here at Wallpaper* – design, architecture, art, and retail therapy. 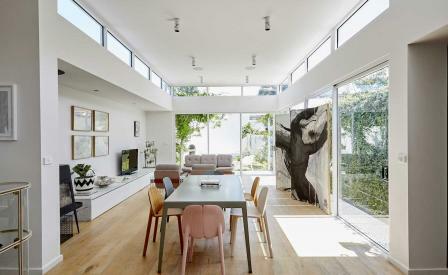 For starters, Studio Edwards has converted a three-bedroom 1870s Victorian house in Melbourne’s St Kilda into a stylish B&B slash art gallery. With its period features of deep eaves, peaked roof, brown tiled roof and long plot, the facade of the house, such a familiar treat of the neighbourhood, gives little away of its interiors. For the most part, Studio Edwards has worked with the existing bones of the building, polishing the wooden floorboards to a shine, and restoring the ancient fireplaces while cladding the bathrooms with geometric black and white tiles. A dining room extension with high clerestory windows that let in plenty of light, leads out into a small garden lined with trellises. However, it’s the walls and broad expanses of floor that separate Gallery House from the pack, festooned as they are with bold, striking installation art and pieces from a clutch of local contemporary galleries including Daine Singer, Backwoods and Lindberg. The exhibits change regularly and each piece is available for sale, all of which provides a new dimension to the idea of a private gallery viewing. Meanwhile, the kitchen is fully stocked and functional, though it seems a little churlish to be holed up cooking during your holidays when the gastronomic spread and coffee culture for which St Kilda is justly famed is right there for the taking.